The Solar Array Cooling System on Solar Probe Plus has one critical job – to protect the NASA spacecraft’s solar arrays from incineration as it moves through the blazing atmosphere of the sun. 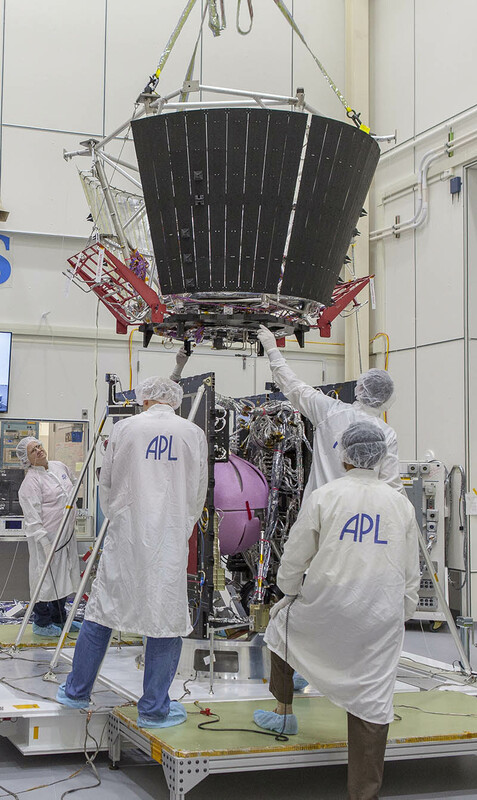 Several key elements of that system are now on board the spacecraft, installed last week during ongoing integration and test operations at the Johns Hopkins University Applied Physics Laboratory (APL) in Laurel, Maryland. On April 5, engineers carefully attached the deck that holds the solar array cooling system components, solar array cooling system radiators and the truss structure assembly, or TSA. The TSA will support the spacecraft’s signature 8-foot-wide, 4.5-inch-thick carbon-carbon foam heat shield, as well components from the FIELDS experiment and Solar Wind Electrons, Alphas and Protons (SWEAP) suite that will make direct measurements of the charged particles and electrical fields in the solar environment. 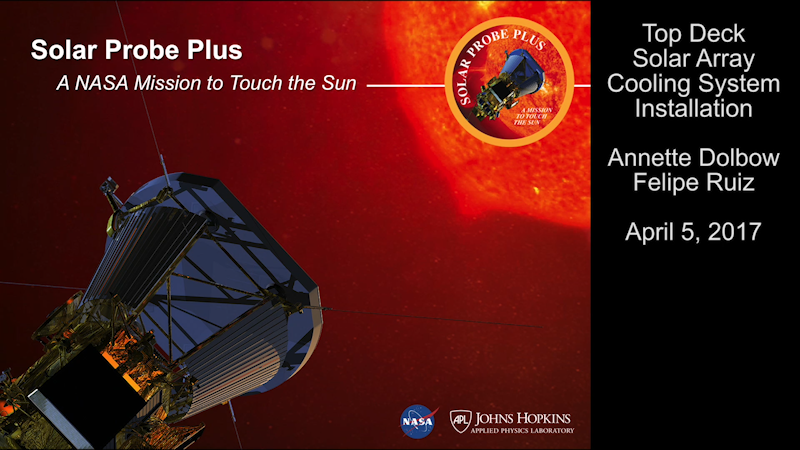 Solar Probe Plus is on track for launch during a 20-day window that opens July 31, 2018. Integration and testing will continue at APL through November; after that, the spacecraft will be moved to NASA Goddard Space Flight Center in Greenbelt, Maryland, for four months of final space-environmental testing, it is then shipped to Kennedy Space Center/Cape Canaveral Air Force Station, Florida, in March 2018 for final launch preparations. 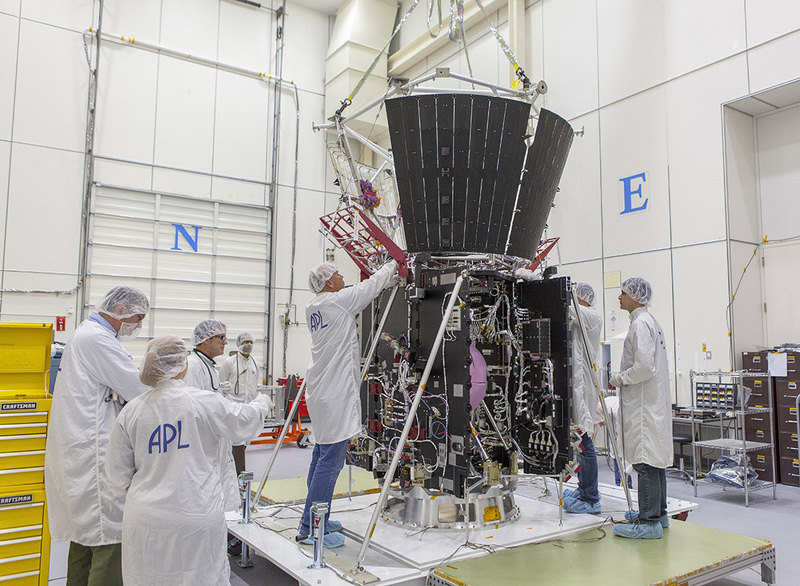 APL designed, is building, and will operate Solar Probe Plus for NASA. Mission integration and test team members secure the deck holding the structure assembly and several other critical thermal-protection components atop NASA’s Solar Probe Plus spacecraft body on April 5, 2017, in the cleanroom at the Johns Hopkins University Applied Physics Laboratory in Laurel, Maryland. From left, Cheryl Starkey, Justin Hahn, Felipe Ruiz, Randy Persaud and Jim Beatty (obstructed by spacecraft) position the deck holding the structure assembly and several other critical thermal-protection components atop NASA’s Solar Probe Plus spacecraft body on April 5, 2017, in the cleanroom at the Johns Hopkins University Applied Physics Laboratory in Laurel, Maryland.